A list of all the guest character parts. 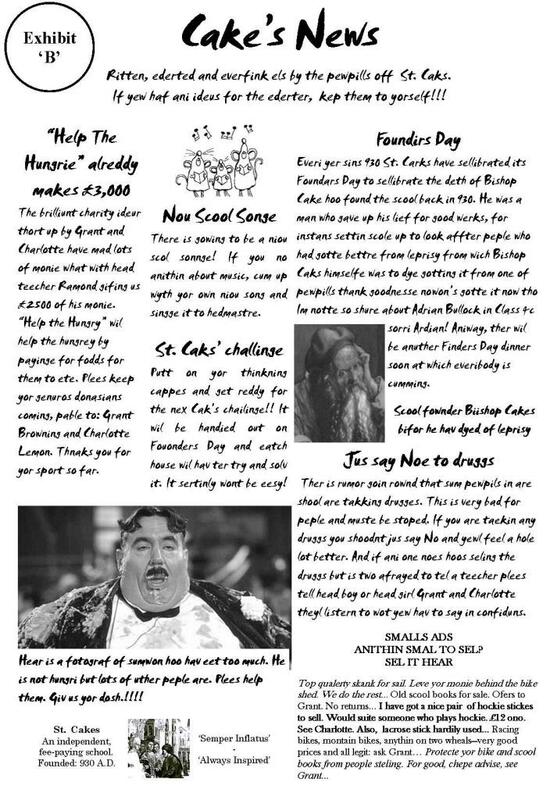 A copy of the School magazine. A history of the School. 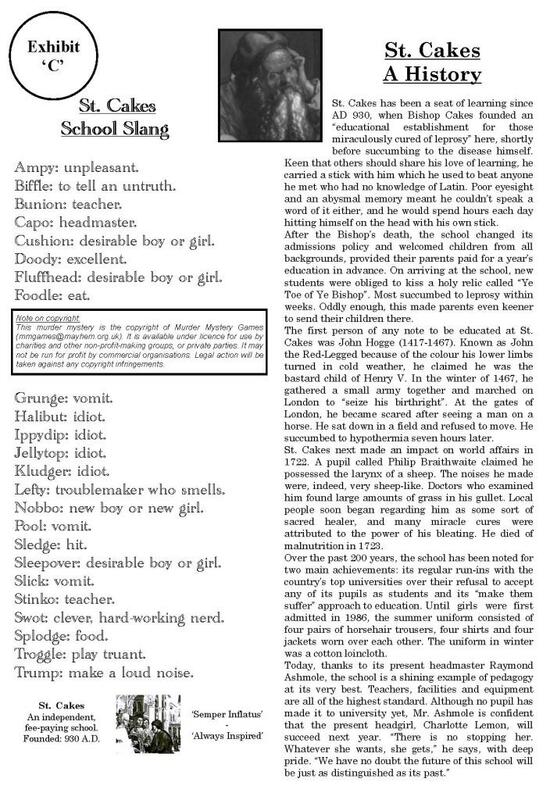 A guide to School Slang. Character information for all of the guest characters. Short speeches for a few of the guest characters to read out. Team information for each team. A step-by-step guide, explaining what the organisers need to do before and during the event so everything runs smoothly. Paper props: clues, coroner’s reports, etc. There are six main guest characters. Everyone will be given a team or “house” to belong to. Each “house” has its own Head of House (team leader), Prefect (motivator) and Swot (the clever one). One of the guests will, of course, be a murderer. To help find out who this person is, every house is given a few clues soon after the first murder happens. They use the clues they have to trade and barter with other houses, in the hope of ending up with a full set. They also have a “St. 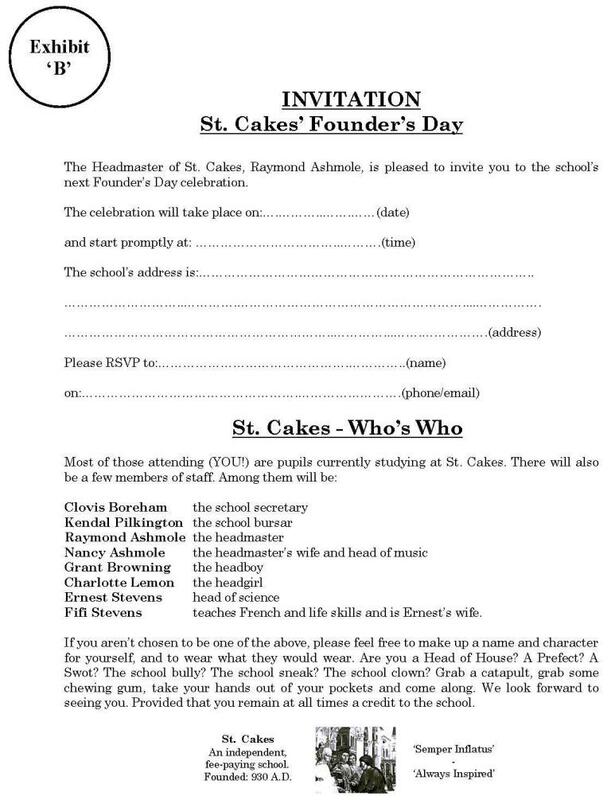 Cakes Challenge” to complete, for which they will be asked to write (and perhaps perform) a new school song. As proceedings draw to a close, the different houses get the opportunity to make their accusations then the correct solution is revealed and the murderer is unmasked. 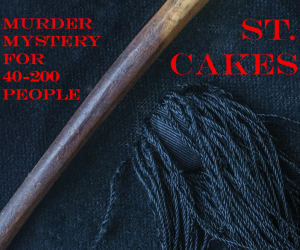 then go to http://www.murdermysterygames.net/shop/cart and follow the instructions you find there. When we receive your payment, we will e-mail you a password which will enable you to download the main game. Yours for US$74.99.